A small flowering crab apple tree, first introduced in France, Comtessa de Paris (Malus 'Comtessa de Paris') has small, elliptic, pretty yellow crabs that usually persist well after Christmas. One of the best persistent yellow crabs of which there are few. 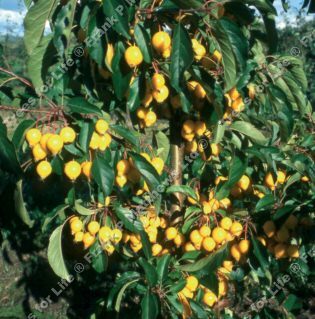 This tree is supplied at a height of between 1.3 and 1.8 metres in a 12 litre container for year round planting and better results than from either bare-root or rootballed stock.